Although it doesn't snow where I live, one of the things that I look forward to most as the nights get longer and the days colder is spending the evenings around the fireplace with my family. It doesn't always go as planned - someone might bring a laptop instead of a book, we might not be able to agree upon a game (Blokus? Sorry? Uno? Ticket to Ride?) or someone might get up for a cup of tea and never return. Despite these inevitabilities, these are special times for me. As I sit here writing my review for John and Caitlín Matthews' newest addition to their brilliant, beautiful StoryWorld Series, I can't help but think that StoryWorld - Christmas Tales, if you celebrate Christmas, is the PERFECT thing to gather your family around on a cold night and is guaranteed to keep anyone from arguing or straying. Hopefully you are already familiar with this set of cards that is to the realm of stories what sliced bread is to the world of sandwiches. If not, take a moment to read anyone on of my reviews of the other Create-a-Story-Kits from the Matthews: StoryWorld, Fairy World, Legends of the Sea and Tales from the Haunted House. 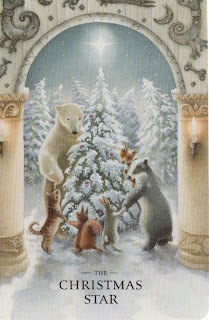 As always, a marvelous cast of illustrators contributes to the story stage in StoryWorld - Christmas Tales. Maggie Kneen, Peter Malone, Deborah McFarlane and Tomislav Tomić, who has contributed to all five of the decks, combine to create a textured, richly detailed world of possibilities. If you are new to these kits, each card has a title, a description and three questions for story-makers to ponder (if they need a little creative nudge - I strongly encourage you to have your kids share their own thoughts about the images before flipping the card over and reading the back.) 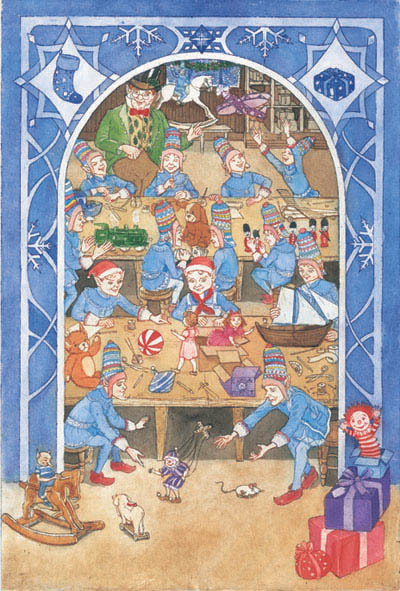 The booklet included with the cards provides and introduction on how to use the kit, a chapter on the tools of storytelling, ideas on how to play alone, with a group, with parents, for two and on a trip. Other ideas include an acting game based on the cards, tips on how to make your own cards to add to the deck, the hidden clues game, the Christmas tree game and a sample story based on the cards. 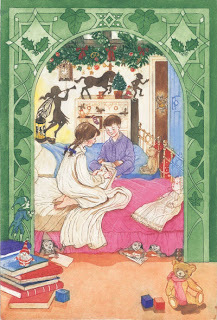 With her illustrations set squarely in the home, Deborah McFarlane's cards show us carolers, Christmas Eve, Under the Tree, the North Pole, a Christmas Wish and a Snowstorm. The Christmas Wish, below, can be "used at Christmas by one lucky child." 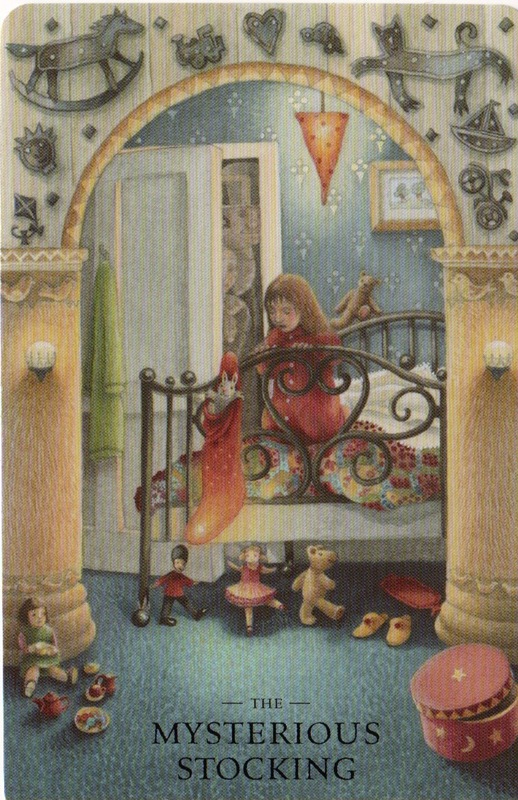 The card asks, "What happens when the child makes his or her wish? "and "Who or what are the shadows on the bedroom wall?" and "Who is watching the children?" 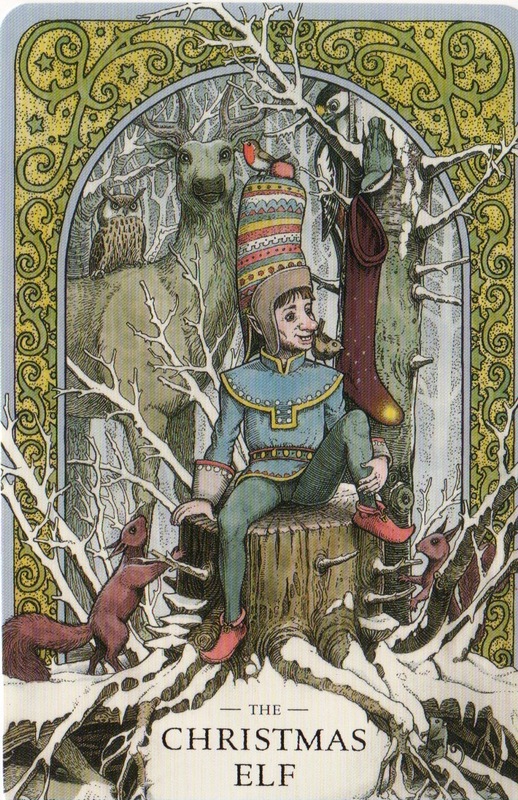 As always, images from the other cards in the deck appear on the borders and within the illustrations themselves, serving as inspiration for linking certain cards for plot purposes as well as for the Hidden Clues game. 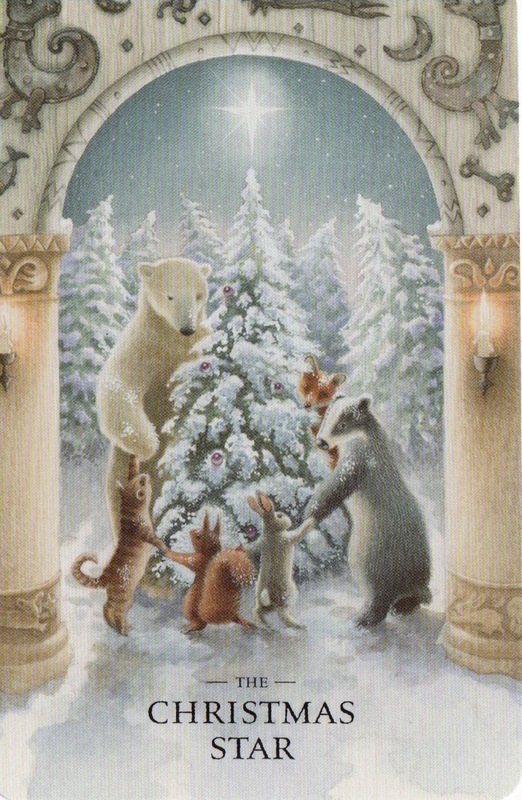 Peter Malone's cards have a bit of a 1940s feel to them and include the Polar Bear, the Friendly Snowman, Scrooge, the Christmas Ghosts, the Robin and the Wren and the Wakeful Children and the Frost Palace, pictured below. 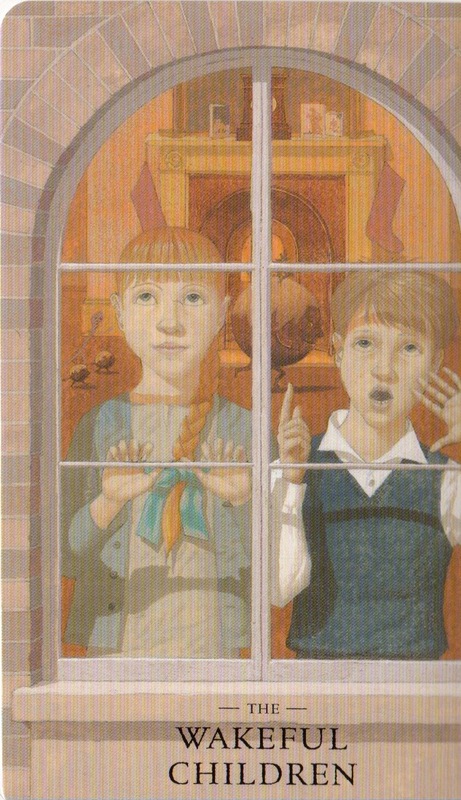 The wakeful children cannot go to sleep on Christmas Eve and the card asks, "What will happen if they're still awake at the stroke of midnight?" and Who is coming to visit, and where might he or she take the children?" and "What have the children seen out the window?" 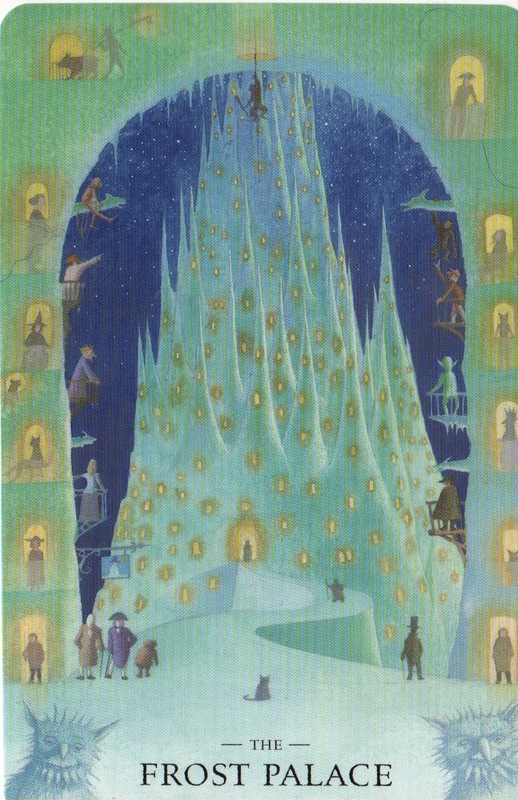 The Frost Palace is the Icy Home of the Frost Queen and King and asks, "Who guards the palace and what magical powers do they have?" and What creatures are trying to get inside?" and "Who made the palace and how did they do it?" 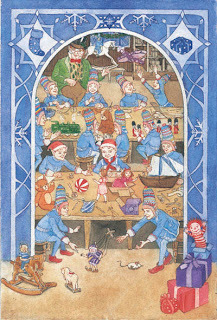 Tomislav Tomić's cards have an antique feel and include Santa Claus, Flying Reindeer, the Frost Queen, The Frost King, Uncle Holly, the Christmas Elf and the Christmas Fairy, pictured below. 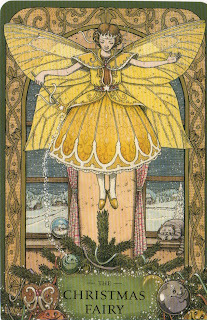 The Christmas Fairy brings magic to people who need it at Christmastime. 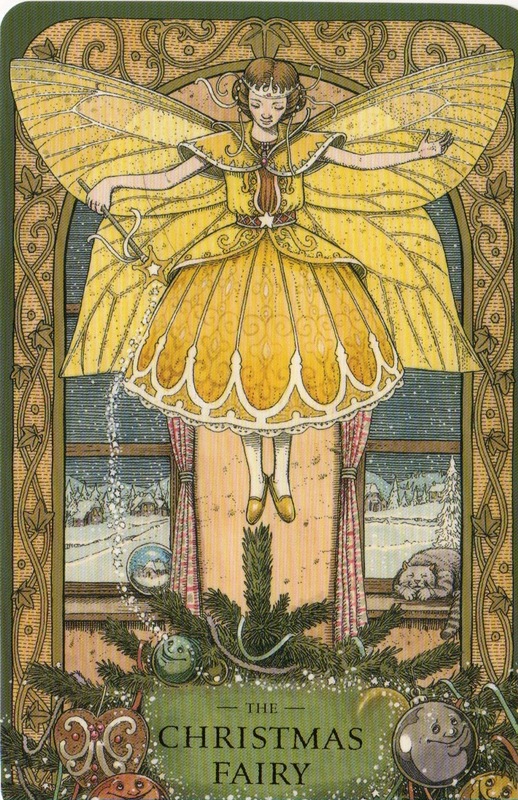 The card asks, "Where does the Christmas Fairy live?" and "Who is building the Christmas tree?" and "What is happening in the snow globe and why?" Maggie Kneen's cards have a soft warmth and playfulness that bring balance to the deck of cards. 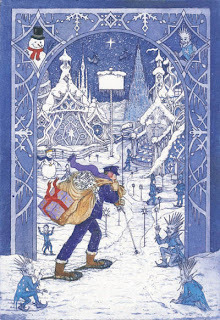 Santa's Sack, the Christmas Cookie, the Lost Present, the Magic Sleigh, Holly, Ivy and Mistletoe, the Christmas Star, and the Mysterious Stocking. 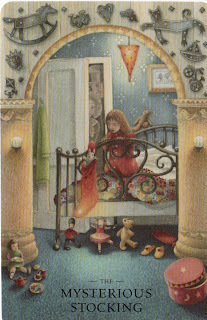 The Mysterious Stocking is full of holiday magic and asks, "Who made the stocking, and why did they leave it here?" and "What do the toys think about it?" and "What will the little girl find inside?" 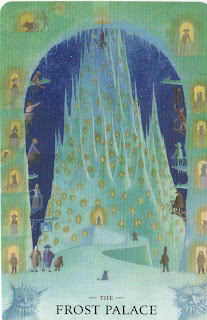 The Christmas Star "sits on top the Christmas tree and spreads happiness." The card asks questions like, "Where did it come from?" and "Why are the animals gathered here, and what are they doing?" and "What magical powers does the star have?" 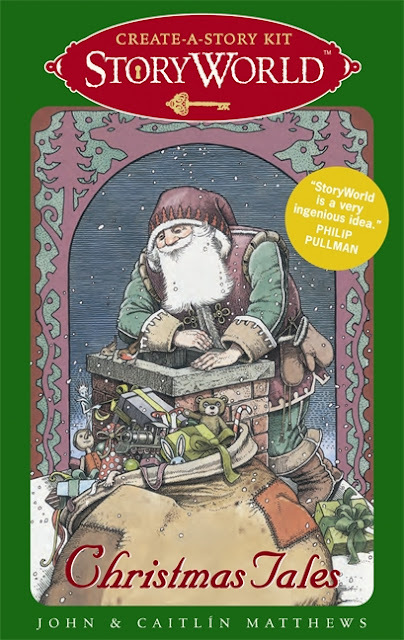 STORYWORLD: CHRISTMAS TALES. Concept and text copyright © 2011 by John and Caitlin Matthews. Illustration and design copyright © 2011 by The Templar Company Ltd. StoryWorldTM © 2009 by the Templar Company Ltd. Reproduced by permission of the publisher, Candlewick Press, Somerville, MA.